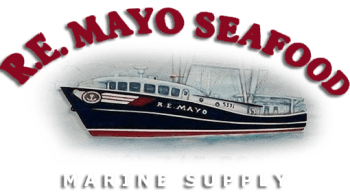 It doesn’t matter if you are a transient, sail or motor vessel RE mayo Seafood is equipped to handle your boating needs. We cover the basics with fuel including ethanol free gas, diesel fuel, dockage, 30 amp service at the docks, ice, bathroom facilities and a safe haven during foul weather. And on the subject of bad weather, RE Mayo Seafood is located just south of the US Coast Guard Station Hobucken. We carry boat parts and have an excellent marine supply store. Service is offered on marine electronics and motors. And for larger needs we have representatives from Caterpillar Diesel near-by and on stand-by. Caterpillar is the world’s largest manufacturer of variety of engines so we made sure to have them close by. Clothing, t-shirts, boots, hardware, drinks and snacks are all available too. We are located on the ICW just south of the Hobucken high rise bridge at channel marker 21. Average water depth is around 12 feet with 6 feet at the docks. We pack fresh and fresh frozen seafood in any quantity you like. Be sure to pick some up at the dock. RE Mayo Seafood with a century of bringing you the very best of what the coast of North Carolina has to offer. Conveniently located serving local and transient alike!